Ardamax Keylogger for Windows 10 allows you to track keystrokes, take a photo of the screen, record the history of the clipboard, IM messages, visited sites. It can be installed on a remote computer with the setting to regularly send data from a PC under control. The program allows you to make covert surveillance with automatic adjustment with photographing the screen at specified intervals. It is possible to intercept messages in messengers, to fix any data entered by the user. Built monitoring sites, web surfing. 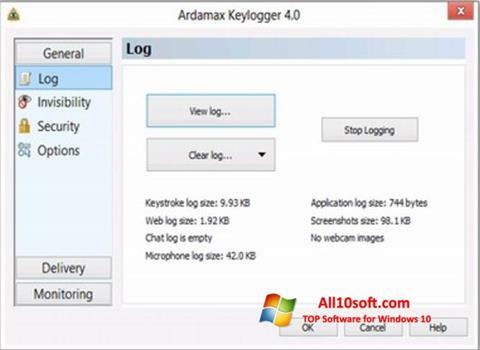 You can free download Ardamax Keylogger official latest version for Windows 10 in English.